Coming back from the Global Specialty Lens Symposium (GSLS) in Vegas, it became obvious to me that large diameter RGP lenses are becoming more mainstream - to the point that attendees and expert were considering small RGPs, hybrids and piggybacks as “scleral alternatives.” We are in the infancy of a new technology that will change the way we fit lenses in the future. And obviously, it brings a lot of unanswered questions. One of them is: considering its diameter (14 to 15 mm), how does a mini-scleral lens work, considering its limited support by the conjunctiva? Here are some considerations in answering this question, an invitation to think outside the box. We have to differentiate a mini-scleral lens, which vaults the cornea as other larger sclerals do, from a corneo-scleral lens, which allows touching the cornea to be supported. In my mind, and I believe that many experts at the GSLS meeting agree, such a fitting (a corneo-scleral one) may not be appropriate, potentially putting too much mechanical pressure on this fragile tissue. This could trigger scarring, epithelial erosion and discomfort. The support of a mini-scleral does not come from the conjunctiva alone. As it is for larger lenses, the fluid layer between the cornea and the lens may act as a water bed that helps to support the mass of the lens. This is why bigger lenses will need more clearance (up to 200 µm) than will smaller ones (150 µm). Limited clearance is considered a key factor to increase oxygen delivery to the cornea. When a lens is designed on purpose to generate much less clearance over the limbal area compared to the central zone, the fluid layer takes the shape of a triangle, which may act as a wedge to better support the mass of the lens. If properly designed, the lens will settle by pushing out some of its fluid without digging too much into the conjunctiva, which would create seal-off and blanching. A poster presented during the GSLS meeting showed this effect with a particular mini-scleral design (Blanchard Labs, Sherbrooke) over a period of 12 hours of wear. In conclusion, mini-scleral lenses work, and their mechanism may be that they are supported not only by the conjunctiva, but also (and maybe even mainly) by the fluid layer and perhaps other mechanisms. This is supported by the fact that some lenses with a particular design do not dig into the conjunctiva over a regular period of wear, as would be expected if the support came only from the conjunctiva. The shape of the fluid layer, as defined by the lens design, also seems to provide sufficient support over the cornea. It is certain that clinical studies should be done to understand more of the mechanisms involved in this process. For the moment, we have to continue to question ourselves to answer these important questions while these lenses continue to gain in popularity. Dr Langis Michaud graduated from École d’optométrie de l’Université de Montréal in 1986 where he also obtained his Master’s Degree in physiological optics (1998). He graduated in public health ( 3rd cycle) from École Nationale d’Administration Publique in Montréal (2006). He is a Fellow of the American Academy of Optometry since 1989 and Cornea and Contact Lens Diplomate since 1994. 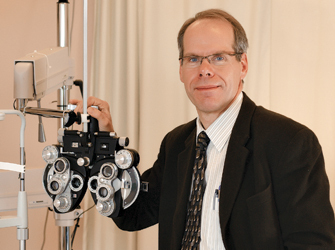 He is a Fellow of the Scleral Lens Education Society since 2010.
and involved in clinical research in cornea and contact lenses﻿ at the École d'optométrie de l'Université de Montréal﻿ (Canada).